I have had the opportunity to be a grease monkey in my days of performing countless oil changes, engine modifications, and perform general shade-tree automotive work. While I consider myself far from an automotive mechanic and have hung up many of my tools in the recent years, I still find myself working on my vehicles to tinker and perform light duty tweaks. Having the right tool for the job is something that you learn over time through trial and error that it’s a must to bite the bullet and purchase the proper tool to make the task at hand easy, and ultimately, doable. 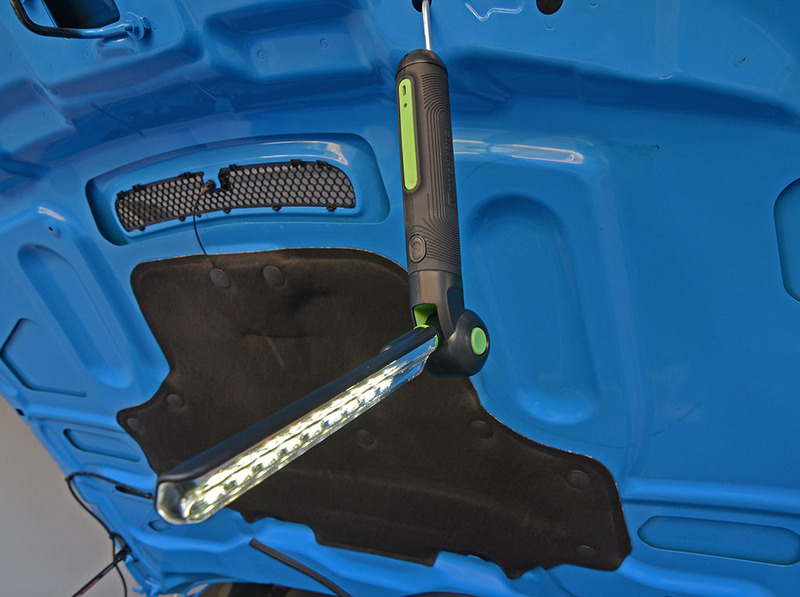 The company MYCHANIC recently reached out to me to try out a few of their essential tools, which are more along the lines of helping make ordinary garage duties easier as you reach a new level of maturity when you try to think smarter instead of working harder. MYCHANIC sent me a nifty Tool Creeper with an LED Pod Light. Together, the combo provided a neat portable lighting solution with a place to temporarily hold my tools upon changing out the lower reverse light on my new Ford Shelby GT350. 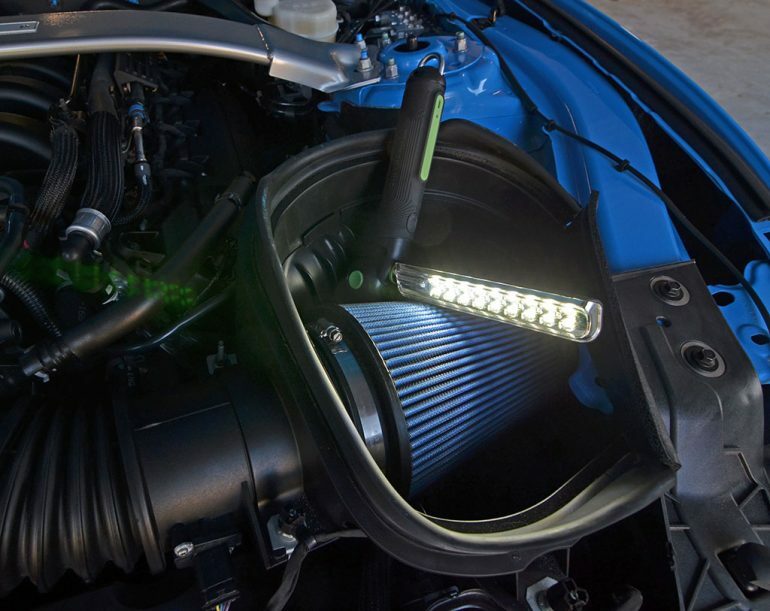 Moreover, MYCHANIC sent me a Blade Multi-Light, which also used LED lights but was more of a handy accessory to add light to my subject in finding the small screws to unbolt an unexpected panel to gain access to change out my GT350’s light. Both lighting sources from MYCHANIC proves to pivot in a way that I could accurately aim the lights exactly where I wanted them. Of course, before even starting my project, I needed to jack up the rear of my vehicle. 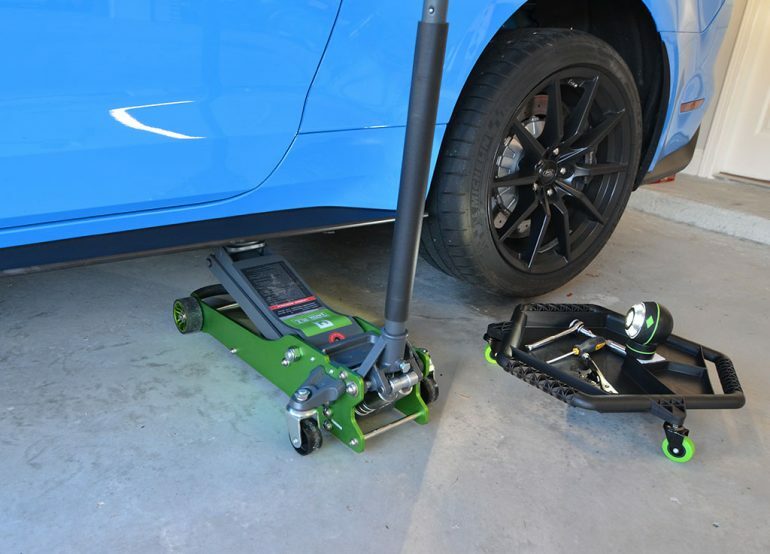 Lucky for me, I had a new MYCHANIC 2-Ton Hybrid Floor jack. While many will believe that there isn’t much to floor jacks these days, there is – a difference in quality, durability, and easy of use. 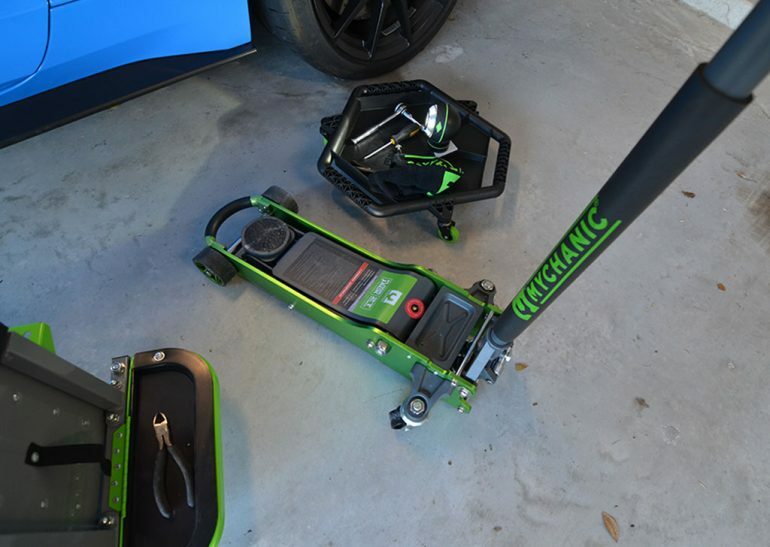 Not to mention, the MYCHANIC floor jack is probably one of the best-looking jacks of its type continuing the green and black theme colors of the MYCHANIC line of tools. 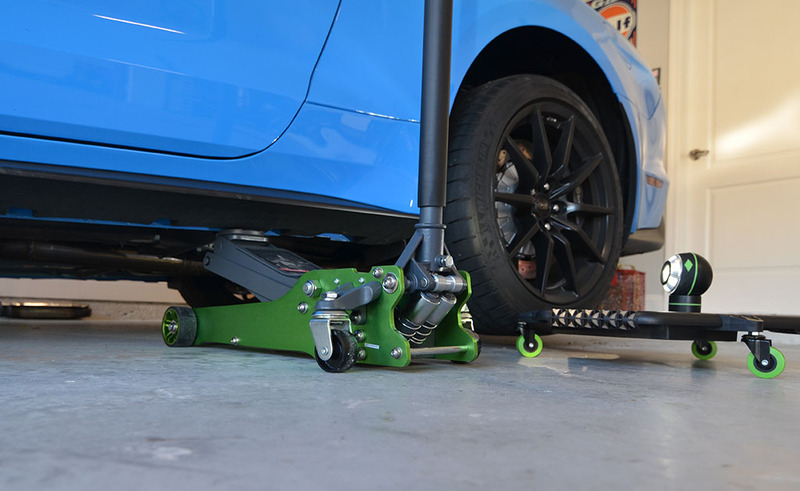 The MYCHANIC 2-Ton Floor Jack, with its 4,400-pound rating and overload protection, treated my GT350 like Dwyane ‘The Rock’ Johnson treats his eyebrows when he’s trying to impress millions of his fans. In all, it lifted the vehicle quickly and with ease. While the floor jack felt as if it could hold the car in the air on its lonesome, I still placed jack stands in place just for my piece of mind and make it easy to get the whole rear of the car in the air. 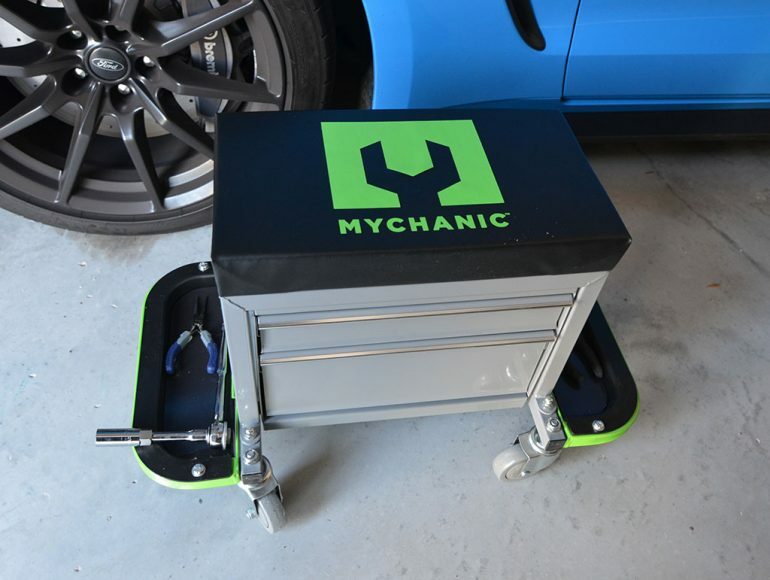 The new MYCHANIC Sidekick Stool, which can be closely compared to many other similar iterations out there on the market, proved to be an essential to save my back in the constant bending on simple garage tasks. The stool, which is over engineered to support up to 400 pounds, has to tool drawers for storage, side tool accesses areas, and a padded seat. 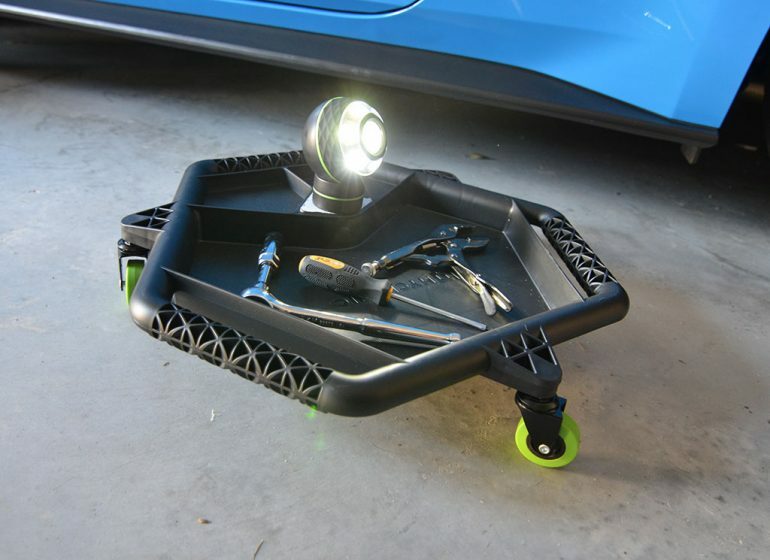 As you can imagine, such a stool caters to those who want to be lazier when it comes to working on low areas around the garage and your vehicles. While I don’t consider myself to be lazy, the Sidekick STool does, however, come in handy after a long day of work and I want to still tinker with one of my cars. 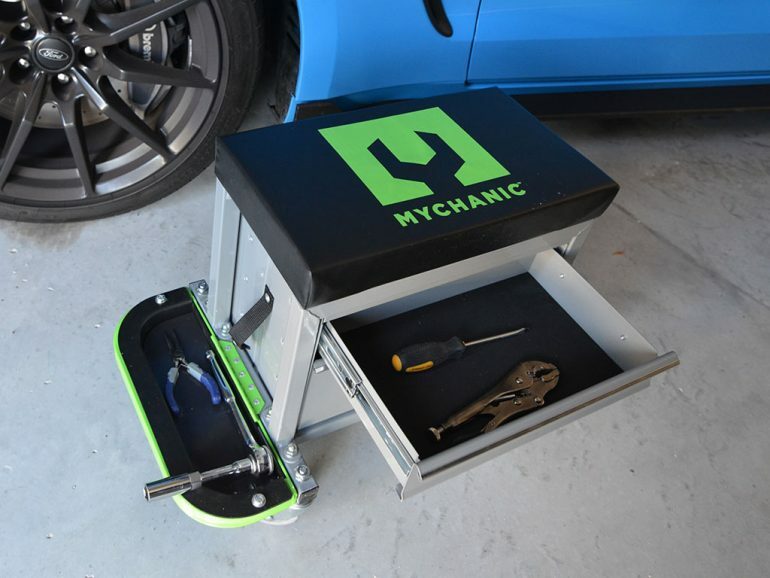 While there aren’t many tools that complement clean and tidy garages out there, MYCHANIC is undoubtedly one tool-maker that can appease you on multiple levels with the looks and proven functionality. For those interested, you can check out the full line of MYCHANIC tools and new items as they are added on the mychanic.com website.